What is this Houston Construction Company All About? You’ve probably heard the adage that actions speak louder than words. It makes sense. After all, the only way to accomplish something — to bring real change — is to get out there and do something about the situation at hand. Right? At T&T, we’re all for getting our hands dirty. But we’re also a Houston construction company that believes words carry their share of importance. 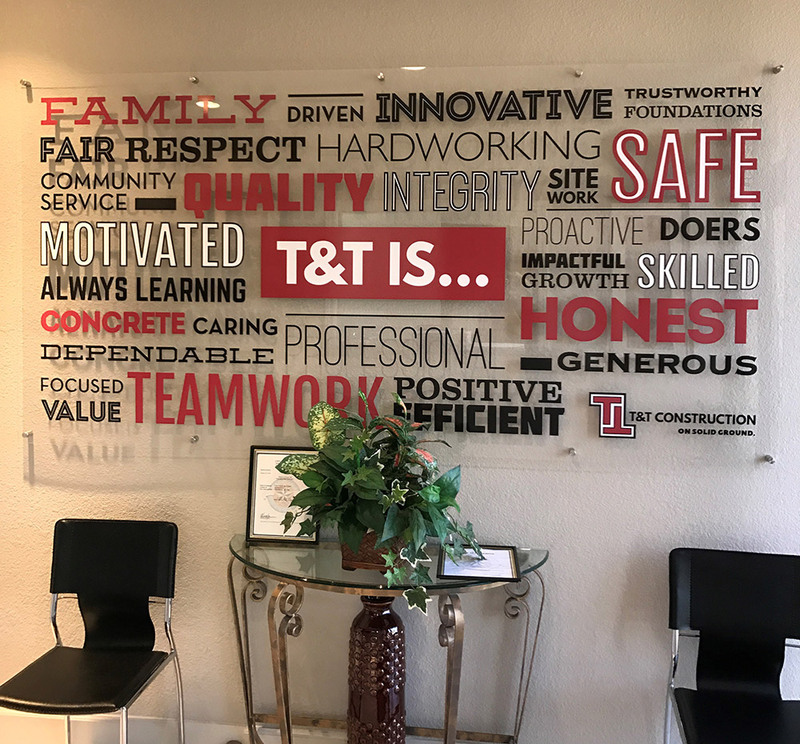 That’s the thinking that led to our new T&T tenets sign. We recently got together with our incredible team members to talk all things T&T. Who are we as a company? Who do we want to be? Which words come to mind when our customers think about us? The process required a lot of inward reflection, conversation, writing, erasing and rewriting. What emerged was a massive list of words and ideals that spoke directly to T&T. The things that we believe make us who we are. So, what made the list? Frankly, quite a few things. There were items that highlighted our guiding principles — “respect,” “teamwork” and “integrity” among them. There were phrases like “always learning,” which touched on our drive to constantly improve ourselves. There were words that spoke to the physical work we carry out each day, such as “concrete” and “foundations.” And when you put them all together, we believe they tell a pretty complete story. We’ve emblazoned this list on a sign that now hangs inside our office. Our hope is that, by keeping these tenets front and center, it will serve as a constant reminder of all we want our company to be. In short, we think it will help us continue working toward improvement each and every day.